What did you do on Friday night? Me? I made homemade sausage. Sounds a bit boring to most folks I would presume. But not to me. It actually was quite exciting because it was only the second time I got to use my sausage stuffer. To each his own. For me, waking up to a plate of fresh sausage is way better than waking up with a hangover. Call me old. I don’t care. I say it’s more a case of priorities. 2 lbs makes 8 sausage. These sausages are more than a little interesting too. They are Moroccan, which means they have loads of flavours we usually don’t find in sausage – cumin and coriander being two. 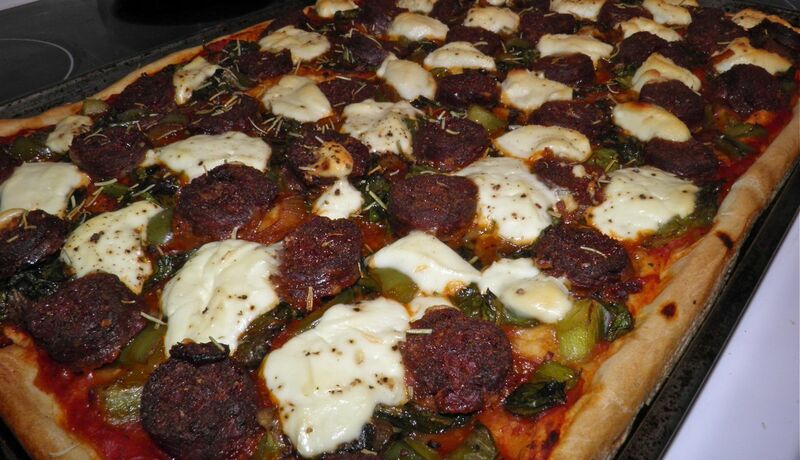 The word “merguez” is most probably from a Berber word (amargez) for pie. The Berbers are from North Africa. It is a common sausage in Morocco as well as the Middle East. 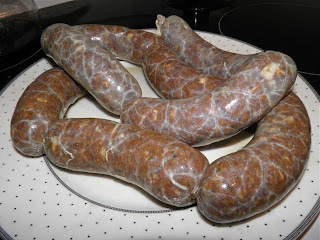 Today the word means “sausage” so it’s a little repetitive saying merguez sausage. Merguez are often used in tagines or simply cooked and served with couscous. As you would expect from being popular in Muslim countries, they contain no pork. They can be made from lamb with lamb fat, beef with beef fat, or a combination of the two. Because they contain smoked paprika and cayenne, the colour is quite dark. And they have a spicy kick as well. They are quite popular around the world now, and if I remember correctly you can purchase them fresh at Pete’s Frootique in Halifax. 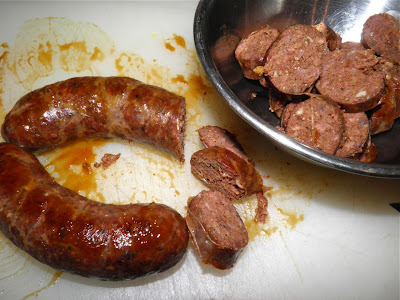 If you have never made your own sausage, either in links or for patties, you should try it at least once. You don’t need a meat grinder, although it does help. Before I purchased mine I “ground” the meat in a food processor. The consistency is a little different, but not much. A simple Google search for "merguez" brought up many recipes that call for its use, and of those many used just the meat – unstuffed. One recipe I found was a simple pizza that had the cooked, sliced sausage, onion, ricotta, a little tomato sauce, rosemary and spinach. It was a very tasty pizza. That was part of Saturday evening dinner. It really wasn't anything more than that. The following never really occurred to me before: making your own is a great way to ensure you are eating gluten-free sausage. It sounds strange to say gluten-free sausage, but it’s true. Many commercial sausages use wheat (often bread) as a filler. If you make your own you know exactly what goes into them. The same holds true for the much maligned hot dog. It’s said that you never know what has been ground into the mix. Some more “unsavoury” pieces of meat are often touted out as possible ingredients. I won’t outline them here. Frankfurters are on my list to make this year. I’ll let you know how they go. In the meantime, if you want to try your hand at this highly spiced, delicious sausage, here’s the recipe! I don’t list a time to make these. It all depends if you’re stuffing or not. 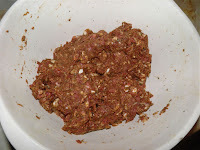 To grind and mix the meat is only about 20 minutes. Cube the beef and fat into 1” pieces. If using suet, it usually comes pre-ground. If not pre-ground, cut it as well. Grind the meat into a bowl using the coarse plate on your grinder. Add the remaining ingredients (except for the casings) and knead well to distribute the spices evenly. Shape as desired or stuff into sausage casings and twist into individual links. Alternatively, if barbecuing you can leave as one whole link. Coil the sausage and pierce with a skewer to maintain its shape then barbecue whole and slice. If making sausages, twist into links about 6” long. You will have 8 links. Let the links sit for at least 1 hour for the flavours to fully develop. The sausages can be refrigerated for 1 week or frozen for several months. I wonder how they would be smoked?